Make breakfast meal prep easier, sweeter, and stress-free with no bake breakfast cookies! NO oven needed—just heat your almond butter and a bit of maple syrup before stirring in the oats and nutty mix-ins. Naturally, oats are a classic healthy breakfast cookie base, rich in slow-digesting carbs and fiber to fuel your busy morning. 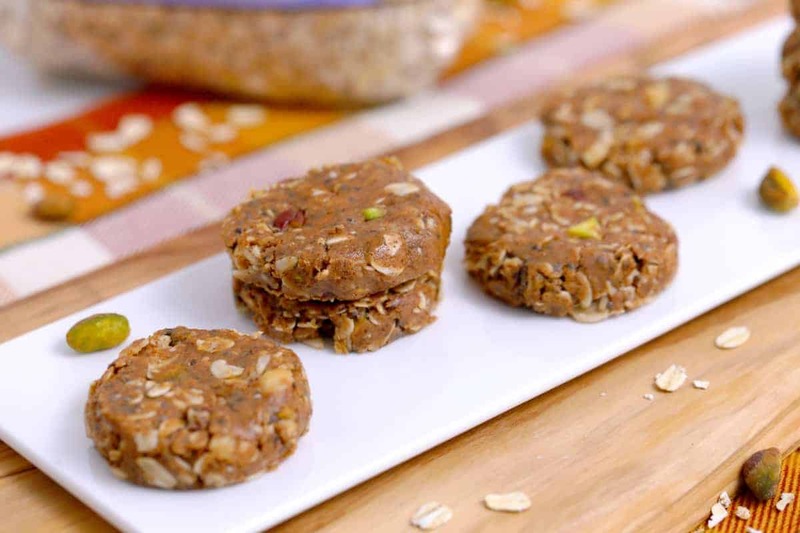 But, I went NUTS with the nuts and seeds in this recipe for nutritiously nutty and ultra crunchy no bake breakfast cookies! Of course, you can use any mix-ins that you prefer, like other nuts/seeds, dried fruit, chocolate chips, or whatever you like. Usually, I prefer a classic baked cookie. But, I’ve gotta admit…I could NOT stop eating these no bake breakfast cookies! They’re deliciously sweet but still low in sugar, and I love the combo with all of the salty flavors in this recipe. Most of all, it’s the crave-ably crunch texture from all of the nuts and seeds that makes these no bake breakfast cookies irresistible to me! Yields 16 no bake breakfast cookies, using a 4-tsp cookie scoop.